Roger Lapébie (pronounced: [ʁɔ.ʒe la.pe.bi]; 16 January 1911 – 12 October 1996) was a French racing cyclist who won the 1937 Tour de France. 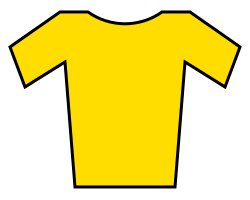 In addition, Lapébie won the 1934 and 1937 editions of the Critérium National. He was born at Bayonne, Aquitaine, and died in Pessac. 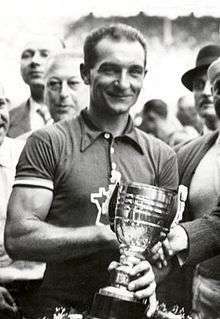 Lapébie won the 1937 Tour by riding 4,415 kilometers in 138 hours, 58 minutes and 31 seconds. His victory was controversial as he was the first rider to complete the race using a modern derailleur. This gave him the advantage of shifting gears without having to stop, dismount and flip the wheel as was customary of racing bicycles used at the time. Lapébie was also known to accept outside assistance in violation of the rules and was at one point penalized 90 seconds by race commissaires. The advantages taken by Lapébie angered his Belgian rival, Sylvère Maes who had won the Tour the previous year. Maes had led the race through the Alps and Pyrenees but decided to quit in protest of Lapébie's tactics and derailleur use after the 16th stage to Bordeaux. Lapébie, in second place, took the yellow jersey in the absence of Maes and kept it until Paris. The victory delighted the French but angered the cycling-proud Belgians. Following Lapébie's victory derailleurs became standard racing equipment in the Tour peloton.